1966 May - Through one of the companies who supplied vehicles to the Brigade, Perris & Kearon, 4 second-hand Hand 6ton semi-trailers were obtained at a cost of £120 each plus a single handling charge of £30. The trailers dated from 1963 and had been in use as drays with a local brewery, Higson’s Ltd. Two were converted into a Ships Firefighting Trailer and a Foam Trailer. They were based at Hatton Garden towed by an Austin tractor unit. Nov - A 2nd tractor unit an Austin FJK 240 was delivered, reg no NKD 162F. Diesel powered it was also fitted with a Scammell automatic coupling. The reasoning put to the Fire Service Committee for this purchase was first if the first tractor broke down and second if one was needed to tow the Canteen Trailer. 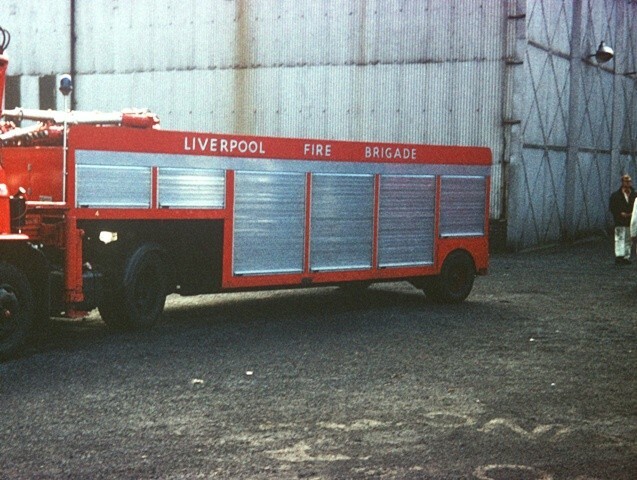 It was based at Belle Vale Rd fire station along with the 3rd and 4th trailers now the Canteen Trailer and Heavy Water Unit. You got me! What is a heavy water trailer? How much heavy water can you fit in to a six ton trailer? Added by on 24 February 2018.